I hate hearing people state we need to do something that is not currently sensible, such as procuring expensive intermittent electricity suppy, because it is the future. ÁNGEL MIRALDA was proud of his 320 solar panels in a field near Benabarre, in northern Spain. They added 56 kilowatts of clean-energy capacity to a country that depended on oil imports. The panels cost €500,000 ($735,000): €150,000 from an early-retirement pay-off from IBM’s Barcelona office, the rest from a bank loan. The government promised a 10% annual return on such projects. That was in 2008. Five years later, after subsidies were cut on July 12th for the third time since 2012, his income is down by 40% and he is struggling to repay the loan. “There is no legal security in Spain,” he complains. Mr Miralda is the victim of a bungled, overambitious renewables programme. Governments everywhere want to turn green and create environmentally friendly jobs. 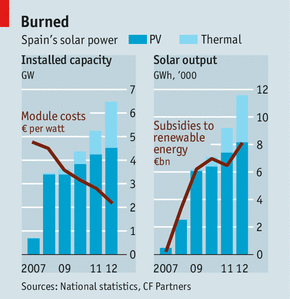 But as Spain shows, good intentions are not enough. If the policies are wrong, the benefits are wasted, the jobs disappear, the costs remain—and business investors bear the brunt. The government failed to cut subsidies when renewables were booming, so the cuts have had to be draconian. It imposed no cap on new capacity and stood by while that grew uncontrollably (this also happened in Germany). The promised jobs have vanished. The solar-energy business has lost tens of thousands of jobs from its peak. And after repeated retroactive cuts no one is willing to invest in renewable energy any more. Yet because projects often receive subsidies for 20 years, the costs remain.